Thank you for your interest in our church. Feel free to explore our site. In doing so, we hope you will discover that Logans Ferry Presbyterian Church is a vital, outgoing, friendly church. Although small in size, we fervently believe that Jesus is our Lord and Savior. We pray your visit to this site will interest you in our mission and ministries, and pershaps, attending our services. More importantly, we pray your association with us, wheather face-to-face or via this media, will lead you to a closer, more personal relationship with God, our Father. If the Oak could have spoken, the tales it could tell; tales of promise in a rich and fertile valley. The Oak would tell that not all the promises were fulfilled; not all was peaceful between settler and Indian. It would tell how in the autumn of 1777 Indian scalping parties became more numerous. So much so, that it was determined that neither Fort Pitt located at the junction of the three rivers nor the post established at Kittanning could protect the settlers in the area. In the spring of 1778 Colonel William Crawford was assigned the task of building a fort near the shallow point in the Allegheny River that was being used as a ford by the Indian raiders. The maturing Oak would have told the tale of how the faith in the promise of this land would not die out, for it was at the site of that fort, named for commander Crawford of the Virginia Regiment, that the Logan’s Ferry/Parnassus Church would be built. It would have told how in 1840 the first church building was erected on the land of John W. Logan while his wife rode horse back from home to home to determine what denomination they should be. As they had originally settled as people of the promise, with their Bibles, their Confessions of Faith and their catechisms, it was soon determined that they should be Presbyterian. To that end, on August 15, 1854, the Presbytery of Blairsville approved for “preaching” at Logan’s Ferry/Parnassus church and the formation of the Presbytery of Westmoreland of which, Logan’s Ferry would be included. It was during this time, so it is told, that members of the Logan’s Ferry/Parnassus church would meet beneath the branches of the Oak, so as to be out of ear-shot of others, as they discussed their involvement in the Underground Railroad. The people of Logan’s Ferry bring the promise of freedom to those who were enslaved. In 1863 as the Civil War grew in intensity the Oak would once again be witness of men called to duty. It was none other than the pastor of the Parnassus/Logan’s Ferry church, Reverend Daniel Townsend who answered the call from President Abraham Lincoln. The announcement was made following the worship service about the need for additional troops and it was under the branches of the Oak that the men mustered the following morning. These men, under the leadership of Reverend Townsend, expected to travel east to Gettysburg, but were instead sent west to Ohio to capture a Confederate renegade. The Oak would have told of how as the decades passed, the promise of this valley changed. What once was considered fertile farmland, became the site of a growing industry. As the needs, dreams and innovation of a nation grew, so did the demand for aluminum. The promise of the American dream was realized for many in the valley as New Kensington became known as “The Aluminum City.” With the growth of that industry so grew Logan’s Ferry/Parnassus church. The Oak would have told of how the congregation grew to the size that it became necessary to hold two worship services each Sabbath. 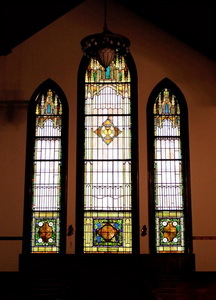 It would have told of how the lights would shine through the stained glass windows as the sanctuary was used time and time again for community functions, including the graduation of high school students. The Oak would have told how the promise of prosperity faded away as Alcoa closed its doors. The economic impact to the city was inevitable. The heart of the once thriving city gave way to the economic blight even as the heart of the Oak succumbed to the bacterial blight that also drained its life away. Today, it is projected that our current population of 39,355 is still destined to decline by .5% reaching a population projection of 37,704 by 2015. The current population reflects a 21% divorce rate among those who have not remarried, and according to Circles ®, 38% of our high school students never graduate. It is into this despair that the Logan’s Ferry church reaches out with renewed promise. As the stump of the Oak still stands as a marker of promise on the site of Fort Crawford; a ‘muster site’ for troops and a ‘marker’ for the Underground Railroad, Logan’s Ferry church stands as the marker of promise for a city that is now showing signs of hope. Yet, we have found a ‘blight’ within our structure. Our 126 year old sanctuary, built in the cruciform style with its high vaulted ceiling and beautiful stained glass windows dedicated to the church’s founding families, was temporarily closed for safety reasons. We have now completed the steps necessary to complete a short-term repair of the hand-hewn beams supporting the roof and have stabilized the outward bowing of the sanctuary walls. The projected cost of complete repair and restoration is $250,000. As a sign of promise to future generations, we are hopeful to raise enough funds to not only make the necessary repairs and restore the structure to its historical integrity, but also to establish a maintenance account, the interest from which would allow necessary repairs and maintenance to be completed thereby preventing such catastrophic degradation from occurring again. Human nature dictates that no one should invest in a lost cause. We firmly believe that our cause is vital to this community. There are signs of hope. It is reported by Mission Insight and the national census that in the zip code area 15068, the current rate of 72% of the population being married, will continue to grow to 74% by 2015. It is also reported that the current population of 22% single female heads of households will fall by nearly 2% in that same timeframe. Even more of a sign of promise is that only 6.7% of the population falls below the national poverty level with only 5.8% unemployed, consistently remaining below the national average. It is with that hope in mind that Logan’s Ferry offers promise through such programs as; Living Well, a community nutrition and fitness program for adults, Circles ®, Bridges Out of Poverty, Resurrection 15068, a community development and social service non-profit organization, Nar-Annon, and among others, the Youth Drama League, a community arts program for teens. As a sign of promise, the Logan’s Ferry church brings no less than $208,477 in community asset value to the 15068 zip code area on an annual basis. As a sign of promise, can you assist us in reaching our goals? Please help us to continue to fight against the blight of despair as we continue to provide not only a place of worship, but an outreach to a community with not only a long and rich history, but a community with a vision for growth. If there is any information you require, please email us, call or visit. Through His Son Jesus Christ, may God bless your time with us.